There are countless studies each year that promise to predict the future of work. Surveys say that telecommuting is on the rise and that performance reviews are a thing of the past. Thought leaders predict that organizational structures will focus on teams and that chatbots will transform HR functions. But what’s actually happening in organizations nationwide? What if we could take a closer look at real data points—real employees, real HR departments, real companies? What if we could remove the inherent bias of surveys and dig into the proof points themselves? 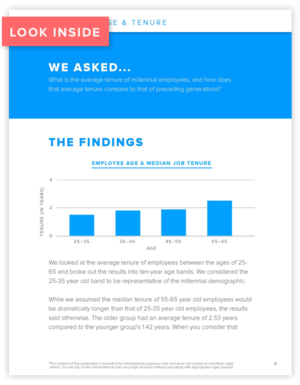 Employee age and tenure: is there a correlation between the two?